During the first year in Seattle, I networked aggressively to sail on a variety of boats and crewed on a J105 for racing. I made new friends and have continued to learn sail trim on the J105. With its hidden harbors, deep waters, wildlife, and mountains in the background, the Pacific Northwest is a rich and vibrant area for sailing. Through networking, I got an opportunity to crew on a 40-foot Hunter based in Portland that would head as far north as the Queen Charlotte Sound in British Columbia. Ken Snow, the boat’s owner, was planning this trip for 45 days beginning in late May 2015. He asked me to be responsible for navigation, and I gladly accepted. I had a granddaughter graduating in June, which meant I would be off the boat for a week and rejoin them in Nanaimo, British Columbia, for the remainder of the trip. I was excited to experience the fjords, people and wildlife of the Salish Sea while increasing my navigation and seamanship skills. The name “Salish Sea” refers to the waters of Puget Sound, San Juan Islands, Straits of San Juan de Fuca, Georgia Straits, Desolation Sound, Johnstone Straits and the Broughtons. The name honors the area’s first inhabitants, the Coast Salish. The first leg of the trip consisted of 70 nautical miles from Portland to Astoria, 230 nautical miles from Astoria to Neah Bay, and 55 nautical miles from Neah Bay to Port Angeles. The challenges of this leg included crew safety, communication, standing watch, crossing the Columbia River Bar, and arriving at Neah Bay with enough daylight to find our way into the marina. Our safety protocol included two-person watches at night, life jackets on in the cockpit, jack lines and tethers attached on deck, a float plan sent to my wife onshore, multiple EPIRBs, and redundant GPS navigation and radio systems. Crossing the Columbia Bar, the system of bars and shoals at the mouth of the Columbia River between Oregon and Washington, requires some sober thought. The bar is 8 nautical miles long from the buoy at Clatsop Spit to buoy number 8. Sailboats average 5 nautical miles an hour. You need a two-hour window to transit the bar. The channel faces southwest to northeast, and the ebb tide reaches 4 knots. Winds frequently come from the southwest, and the sea state can change in as little as 30 minutes. Fortunately, you have a wealth of information to help you decide when to go out and when to stay in the slip. First, I consult my primary weather source, the NOAA Ocean Prediction Center (bit.ly/noaapacific), to see what weather is brewing at the coast and farther out. Next, I consult the daily U.S. Coast Guard observations (bit.ly/columbiabar) to check the sea state and see if the bar is opened. Then I check the Columbia Bar tides and currents (bit.ly/washcurrent). Finally, you can get real-time data from the Clatsop Spit buoy out on the bar (bit.ly/buoycenter). 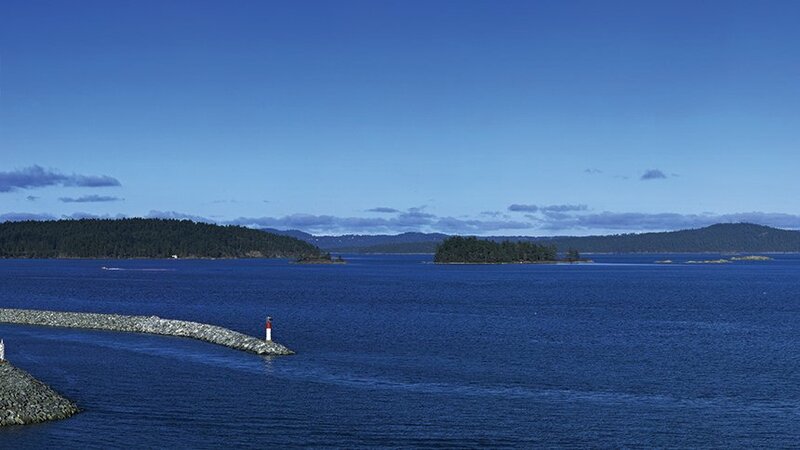 Our next destination, Cormorant Island, about 6 nautical miles east of Port McNeill, can be accessed by ferry, float plane or land plane. About 1,500 people live on the island and two-thirds are members of the ’Namgis First Nation living on two First Nation reserves and in Alert Bay village. The ’Namgis are part of the Kwakiutl peoples in that they share the Kwak’wala language. ’Namgis lived in bands from Campbell River in the south to Queen Charlotte Sound in the north. Adults in Alert Bay still speak Kwak’wala. They have struggled for well over 100 years to maintain their heritage. This land of totem poles, carvings and great legends of thunderbirds, ravens, whales and bears is alive with people caring for their heritage. 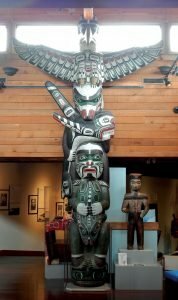 On Alert Bay, the U’mista Museum contains many sacred objects such as masks used at a potlach, a Kwakiutl ceremony of dance, song and gifts. A potlatch would be held in the long house of a local chief. During the potlatch, hunting and fishing rights were granted. Until the late 1950s, potlatches were banned in Canada and the U.S., and the governments confiscated gifts, masks and ceremonial costumes. The Kwakiutl created the U’mista Museum after regaining their possessions in 1970. From the museum to the marina, the 1-mile walk is filled with carvings and art that face the water. As I walked along, I soaked up the spirit of the place, which contained far more art than I could appreciate all at once. Back at the marina, we reluctantly got the boat ready to leave this magical place. 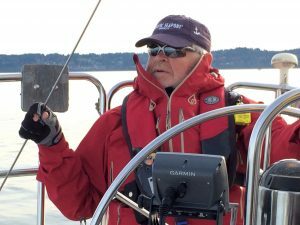 Patrick O’Brien is a senior sailor and blogger with sailing experience on the East and West coasts as well as the Caribbean and British Columbia. He can be reached via his blog salishseajournal.com.